The Dionysiou Monastery (Greek: Διονυσίου) is one of the twenty monasteries located on the peninsula of Mount Athos in northeastern Greece. The monastery is on the southwestern side of the peninsula. 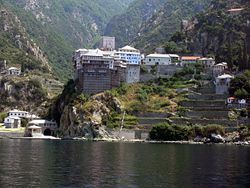 Dionysiou ranks fifth in the hierarchical order on Mount Athos and is dedicated to St. John the Baptist. Dionysiou Monastery was founded in the fourteenth century by St. Dionysios of Koreseos. The golden bull (chyrsobull) authorizing the founding of the monastery was signed in 1374 by Alexios II Comneno. A treasure, the bull is kept in the monastery. Construction proceeded with financial aid from emperor Alexios III Comnenos. The monastery is built along the western coast of the peninsula on a rocky cliff high above the sea and overlooking a deep wooded ravine. In 1535, the monastery was swept by fire destroying it. Reconstruction began quickly and by 1547 the principal church of the monastery, the katholikon, had been built and painted with several murals (frescos) by the Cretan painter Tzortis. A golden iconostasis was added in the eighteenth century. Around the katholikon are number of chapels including one that is dedicated to the Virgin Mary. Inside the monastery walls, a 25 meter high (80 feet) defensive tower was built in 1520. The tower was used periodically for safe keeping of the monastery's library. A dynamic community of monks now inhabits Dionysiou and has undertaken the job of renovating and redecorating the older buildings. The well organized monastery library contains many old documents, including 804 codices and more than 5,000 old printed books. Among the holdings are Gospels (Evangels) from the eleventh century as well as chrysobulls (golden bulls) and manuscripts. Among these manuscripts is an illuminated Gospel from the thirteenth century. The relics of St. Niphon, Patriarch of Constantinople, are housed in a special crypt in the katholikon. This page was last edited on December 29, 2009, at 22:49. This page has been accessed 24,000 times.